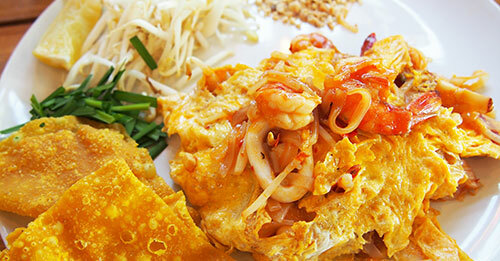 While travelling Phuket, you will find a wide range of food in various restaurants. The flavour of Thai food is well known all over the world, so Thai food should come first on your food menu. There are lots of insanely delicious and incredibly flavourful Thai foods in Phuket. It is a pretty daunting task to choose the best Thai items for your lunch or dinner. 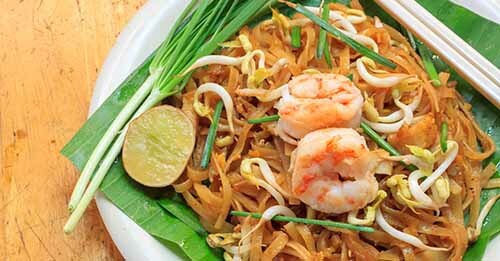 Considering healthful food ingredients, spices, taste, smell and quality, we have chosen the 8 best Thai food you can taste whilst on your Phuket holiday. with locals and expatriates alike. It achieves the prestige of being first on the list of the 8 best Thai food for its extraordinary style, taste & quality. It is a stir-fried dish made from rice noodles, egg, chilli and tofu along with a variety of accompaniments which include prawns or chicken. Whilst it is everywhere in Phuket, it is abundant at roadside cafes. 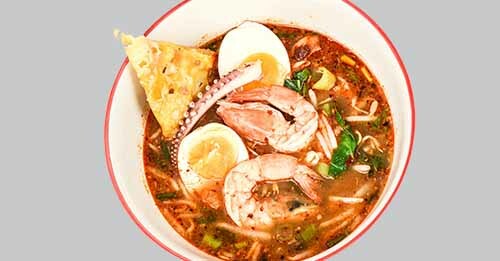 2.Tom Yum Goong: Tom Yang Goong (‘goong’ meaning prawns) is arguably one of our selective 8 best Thai foods in Phuket. It is an aromatic dish of countless fragrant herbs & spices lurking enticingly inside. With lemongrass, lime leaves, shallots and local favourite galangal, it entices most visitors to ravenously consume. You can eat Tom Yum Goong in most restaurants in Phuket including Bang Pae Seafood restaurant at PA Khlok, Thalang, and Ang Seafood restaurant on Phuket road, on the way to Saphan Hin. fond of curries. 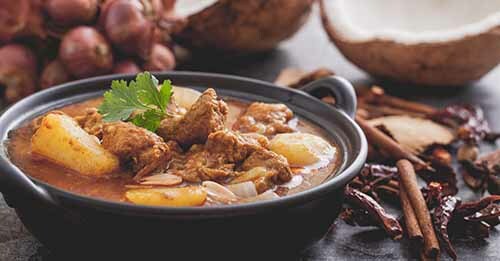 It is basically a beef-based dish and popular for its coconut milk-infused flavour and soft potatoes. Finished with chopped roasted peanuts (or cashews) and an assortment of spices, it is one of the 8 best Thai Foods in Southern Phuket. N.C. restaurant at Talad Yai, Muang, and Oriental Spoon restaurant on Surin Beach Road, Muang are 2 best restaurants to consume Massaman Curry. 4. Roti Nam Geang: Roti Nam Geang is a spicy form of the sweet “roti”(or flatbread) found everywhere on this island. It is a favourite dish amongst the locals & expatriates alike. The Muslim spicy trade had a profound impact on this roti for spices, and flavours were preferred by Hokkien & Tamil migrants. Roti Nam Geang is generally served with delicious chicken, beef or fish variations. select Por Pia from­ the 8 best Thai food list. 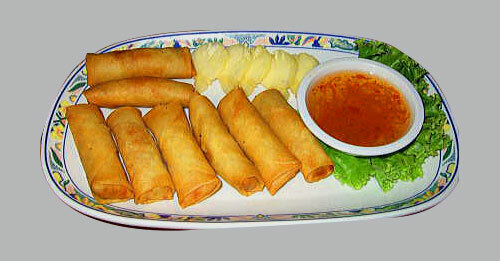 Freshly made fried spring rolls usually served with an apricot dipping sauce are known as Por Pia. It may also contain pork, lettuce or shrimp. It is more popular with tourists than its traditional counterparts and immensely found in sit-down restaurants as well as the street vendors. 6. 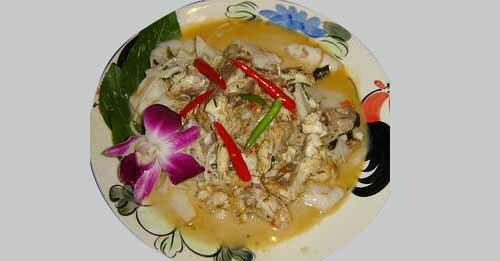 Gai Med Ma-Muang: Gai Med Ma-Muang is one of the 8 best Thai foods in Phuket and available on the menu of all restaurants. It is a sweet, slightly spiced dish packed with nutritious vegetables. It is a variation of “Kung Pao Chicken,” which is a Sichuan Chinese meal. 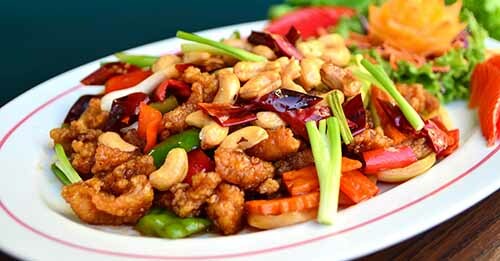 Gai Med Ma-Muang may be a combination of chicken and cashew nuts instead of peanuts used in “Kung Pao Chicken”. It is a great opportunity for visitors to taste such a Thai food without succumbing to a spice overload. 7. Homok Talay: Homok Talay is a spicy curry fish mousse which is steamed with the leaves of a local plant named Bai Cha-ploo and wrapped in a banana leaf. But before eating, beware, it might come spicy, hot and occasionally with a strong fishy taste! You can taste this dish in many restaurants including Ruen Thai restaurant at Bang Tao Beach. 8. Oh Eaw: Oh Eaw is the best Thai Food and very familiar with locals and visitors for its unparalleled taste. 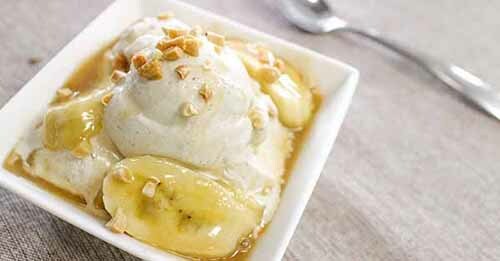 It is a kind of dessert made from ripe banana. It is consumed with rice, red beans and sweet syrup. You can take it mostly during the summer season. For tasting this dessert, you can visit Phuket local food centres, like Loktien Restaurant. The list of the 8 best Thai food will stimulate your appetite for some yummy Thai dishes. You can go to any local restaurant and order the desired item to take a taste of famous Thai flavour. PhuketNow.com is committed to providing you with the best information for making your holiday an amazing adventure in Phuket-Now enjoy!